By Nancy Komlanc, M. Ed. The brain changes as we age and memory skills may start to decline. The brain is like a muscle, and the more we use it, the stronger it becomes. Learning new skills throughout our lifetime is one way to improve brain function and strengthen our memory. Furthermore, the ability to learn does not decrease with age. Multiple studies have shown that memory is improved and cognitive decline is reduced when the brain is challenged by learning a new activity such as playing an instrument, learning a foreign language, taking up a hobby such as photography or painting, and the list goes on. One of the biggest challenges that older adults face is learning to use technology. Technology — specifically cell phones and computers — plays such an important role in our lives that older adults who aren’t using technology often find themselves missing out on vital communication with family and friends. The fact is that younger people use e-mail, text messaging, video-chat, or Facebook as their primary ways to communicate. Writing letters, sending cards, and calling on the phone are being used less and less. 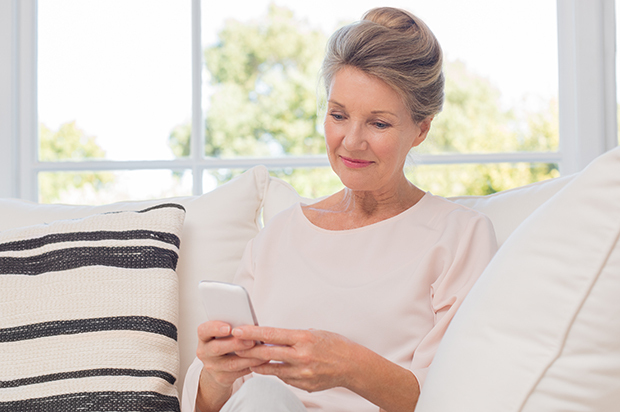 For older adults — or adults of any age — learning to use a smart phone or a computer offers many benefits. The simple act of learning something new helps to strengthen the brain, which includes strengthening memory skills, and then actually using the technology can help compensate for memory decline. However, many older adults are afraid and anxious about working with cell phones and computers. Anxiety can be a natural by-product of the aging process and, let’s face it, the selections of apps and all the features can be overwhelming and confusing. The small print can be hard to read and the small application icons hard to press. So it’s no surprise that fears, anxiety, and embarrassment about engaging with technology cause many to be frustrated, have a self-defeating attitude, and resist attempting to learn. Cell phones are designed for the younger user, but they can be modified so that older adults can use them as a valuable memory aid to support areas of the memory that are weak as well as to promote physical independence, personal safety, and ward off isolation. For example, applications (apps) can be used for daily prescription reminders, electronic calendars and alarms can be employed to help remember doctor’s appointments or daily tasks. For better readability, the font/type size can be adjusted on cell phones, computers, and electronic books such as the Kindle. For those who are visually impaired, cell phones offer voice-recognition features. This means you can talk and speak the name of the person you want to call instead of trying to dial the long phone number. On all flip phones or smart phones speed dialing can be set-up. Once older adults understand the many benefits of embracing technology, they’ll most likely have the desire to use it too. It’s important to remember that school-aged children and young adults have never known a world without technology. So, what seems easy for younger people, is very difficult for older people. Unfortunately, there are very few structured opportunities for the older adult to learn the skills needed to navigate our technological world. A one-time class or presentation isn’t enough to become competent. It may be beneficial to hire an outside professional educator to teach your loved-one how to use their cell phone or computer. This professional should assess the needs of the learner while patiently demonstrating and teaching how to use the technology for their specific needs. This compassionate and understanding approach will reduce the fear and help motivate reluctant adults to learn these new skills. Nancy Komlanc has over 25 years of teaching experience in educational and corporate settings. As an educational consultant, she specializes in teaching clients over age 50 how to use their cell phones and computers. To schedule an appointment for private tutoring, contact her at techtutor100@gmail.com.